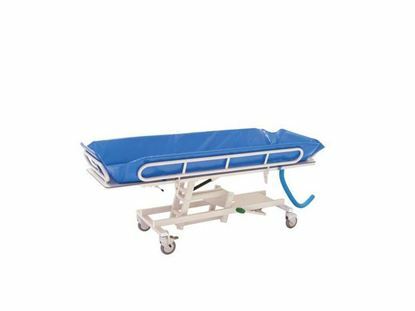 Urgencies Stretcher Trolley - 10005 is a Transport Stretcher Trolley, adjustable in height from Steel structure with epoxy coating, in grey color,Adjustable in height by hydraulic pump system, pedal action and Collapsible side rails. 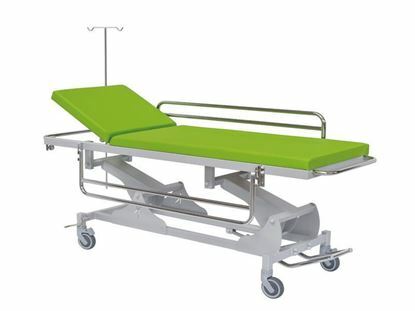 Urgencies Stretcher Trolley - 10016 is a Transport Stretcher Trolley, adjustable in height,made from Steel structure with epoxy coating, grey color,with Adjustable height by hydraulic pump system action by pedal,Adjustable headrest by gas spring 67º and Tuck away side rails. Shower trolley Inmoclinc 10300 is a Shower Trolley, adjustable in height made of Stainless steel and epoxy coating structure,with Adjustable in height by hydraulic pump system, pedal action and PVC watertight mattress with draining hole and tap. Double Soiled linen trolley Inmoclinc 10235 made of Chromed steel structure with Two removable cloth sack treated with plastic. 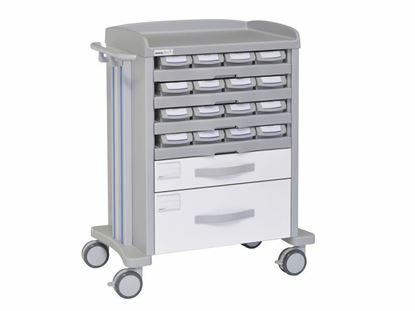 Medication trolley Inmoclinc 72010 is a trolley with 16 drug dispensary bins,made by Aluminium and steel structure with epoxy coating with ABS upper top with extended up rims on three sides,Lateral push handle,High impact ABS base,4 shelves with 16 drug dispensary bins and 2 Drawers. 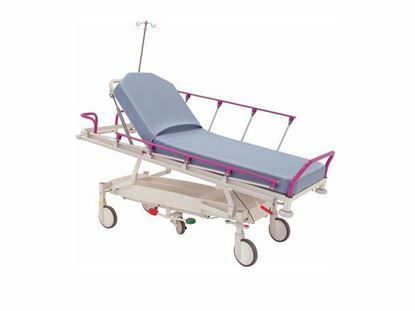 ECG auxiliary table Inmoclinc 14152 is made of Painted steel structure,with Upper MDF board laminate shelf with guard rails on three sides and Steel epoxy coating lower shelf.